The emergence of new biotechnologies provides great promise for biodefense, especially for key objectives of biosurveillance and early warning, microbial forensics, risk and threat assessment, horizon scanning in biotechnology, and medical countermeasure (MCM) development, scale-up, and delivery. Understanding and leveraging the newly developed capabilities afforded by emerging biotechnologies require knowledge about cutting-edge research and its real or proposed application(s), the process through which biotechnologies advance, and the educational and research infrastructure that promotes multi-disciplinary science. Innovation in research and technology development are driven by sector-specific needs and the convergence of the physical, chemical, material, computer, engineering, and/or life sciences. Biotechnologies developed for other sectors could be applied to biodefense, especially if the individuals involved are able to innovate in concept design and development. Of all biodefense objectives, biosurveillance seems to have reaped the most benefit from emerging biotechnologies, specifically the integration and analysis of diverse clinical, biological, demographic, and other relevant data. More recently, scientists have begun applying synthetic biology, genomics, and microfluidics to the development of new products and platforms for MCMs. Unlike these objectives, investments in microbial forensics have been few, limiting its ability to harness biotechnology advances for collecting and analyzing data. Looking to the future, emerging biotechnologies can provide new opportunities for enhancing biodefense by addressing capability gaps. Inova Healthcare. Transforming healthcare with groundbreaking genomics research. http://www.inova.org/itmi/home. Accessed 4 Oct 2017. Biotechnology Industry Organization. Current uses of synthetic biology for renewable chemicals, pharmaceuticals, and biofuels. 2013. https://www.bio.org/sites/default/files/files/2013-03-03-Synthetic-Biology-Products.pdf. Accessed 9 Dec 2018.
iGEM. Colour generators. 2009. http://2009.igem.org/Team:Cambridge/Project/Pigments. Accessed 4 Oct 2017. Strychalski E. Biological Control. 2016. https://www.darpa.mil/attachments/BiologicalControlProposersDay(Strychalski).pdf. Accessed 4 Oct 2017. Department of Defense. Transformational Medical Technologies Initiative (TMT): OUSD (AT&L) FY2007. https://www.hsdl.org/?abstract&did=10926. Accessed 9 Dec 2018. US Army Medical Research and Material Command. 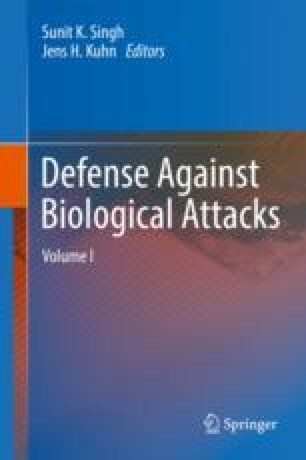 Medical chemical biological defense research. http://mrmc.amedd.army.mil/index.cfm?pageid=medical_r_and_d.medchembio.overview. Accessed 5 Oct 2017. Food and Drug Administration. Extramural research: current MCM-related research projects. 2017. https://www.fda.gov/EmergencyPreparedness/Counterterrorism/MedicalCountermeasures/MCMRegulatoryScience/ucm391318.htm. Accessed 6 Oct 2017.
International Society for Infectious Diseases. ProMED-Mail. 2017. http://www.promedmail.org/aboutus/. Accessed 6 Oct 2017. Public Health Agency Canada. About GPHIN. 2017. https://gphin.canada.ca/cepr/aboutgphin-rmispenbref.jsp?language=en_CA. Accessed 6 Oct 2017. World Health Organization. Epidemic intelligence – systematic event detection. 2017. http://www.who.int/csr/alertresponse/epidemicintelligence/en/. Accessed 6 Oct 2017. European Commission. Crisis preparedness and response: medical intelligence in Europe. https://ec.europa.eu/health/preparedness_response/generic_preparedness/planning/medical_intelligence_en. Accessed 6 Oct 2017. Institute for Health Metrics and Evaluation. Biolding a new approach to research through high technology. 2017. http://www.healthdata.org/events/seminar/building-new-approach-research-through-high-technology. Accessed 6 Oct 2017. HealthMap. HealthMap. 2017. http://www.healthmap.org/site/about. Accessed 6 Oct 2017. Centers for Disease Control and Prevention. National Syndromic Surveilllance Program: BioSense Platform. 2017. https://www.cdc.gov/nssp/biosense/index.html. Accessed 6 Oct 2017. Centers for Disease Control and Prevention. Guidance for supplementary activities in support of the early warning infectious disease surveillance system. 2004. https://www.cdc.gov/phpr/documents/coopagreement-archive/fy2004/ewids-attachi.pdf. Department of Homeland Security. National Biosurveillance Integration Center. https://www.dhs.gov/national-biosurveillance-integration-center. Accessed 6 Oct 2017. US National Institute of Allergy and Infectious Disease. NIAID biodefense research agenda for Category A agents. https://www.hsdl.org/?abstract&did=441285. Accessed 6 Oct 2017. Federation of American Scientists. Biocontainment laboratories. 2007. https://fas.org/biosecurity/resource/research.htm. Accessed 6 Oct 2017. US National Institute of Allergy and Infectious Diseases. NIAID emerging infectious diseases/pathogens. 2016. https://www.niaid.nih.gov/research/emerging-infectious-diseases-pathogens. Accessed 6 Oct 2017. US National Institute of Allergy and Infectious Diseases. Modeling immunity for biodefense. 2016. https://www.niaid.nih.gov/research/modeling-immunity-biodefense#overview. Accessed 6 Oct 2017. US National Institute of Allergy and Infectious Diseases. Genomic centers for infectious diseases. 2016. https://www.niaid.nih.gov/research/genomic-centers-infectious-diseases. Accessed 6 Oct 2017. US National Institute of General Medical Sciences. Models of infectious disease agent study (MIDAS) overview. 2017. https://www.nigms.nih.gov/Research/specificareas/MIDAS/background/Pages/Overview.aspx. Accessed 6 Oct 2017. US National Science Foundation. Investigating the spread of infectious diseases with NSF, NIH, UK funding. 2011. https://www.nsf.gov/news/news_summ.jsp?cntn_id=121607. Accessed 6 Oct 2017. US National Science Foundation. Ecology and evolution of infectious diseases. https://www.nsf.gov/news/special_reports/ecoinf/inf.jsp. Accessed 6 Oct 2017. US National Science Foundation. Ecology and evolution of infectious disease. 2017. https://www.nsf.gov/funding/pgm_summ.jsp?pims_id=5269. Accessed 6 Oct 2017. US Agency for International Development. Emerging pandemic threats. 2016. https://www.usaid.gov/news-information/fact-sheets/emerging-pandemic-threats-program. Accessed 6 Oct 2017. Homeland Security University Programs. Animal disease defense. 2017. https://www.hsuniversityprograms.org/centers/emeritus/zadd-animal-disease-defense/. Accessed 6 Oct 2017. Homeland Security University Programs. Food defense. 2017. https://www.hsuniversityprograms.org/centers/emeritus/fpdi-food-defense/. Accessed 6 Oct 2017. Homeland Security University Programs. Data and visual analysis. 2017. https://www.hsuniversityprograms.org/centers/emeritus/cvada-data-visual-analytics/. Accessed 6 Oct 2017. Department of Homeland Security. National Biodefense Analysis and Countermeasure Center. https://www.dhs.gov/science-and-technology/national-biodefense-analysis-and-countermeasures-center. Accessed 6 Oct 2017. US National Institute of Justice. Forensic applications of microbiomes. 2016. https://www.nij.gov/topics/forensics/evidence/Pages/microbiome.aspx#summary. Accessed 6 Oct 2017. US National Institute of Justice. Funding for forensic research and development, DNA analysis, capacity enhancement and other activities. 2016. https://www.nij.gov/topics/forensics/Pages/funding-history.aspx?tags=Forensics. Accessed 6 Oct 2017. US Center for Advanced Research in Forensic Science. U.S. Center for Advanced Research in Forensic Science. 2017. http://forensic-research.org/. Accessed 6 Oct 2017. US Government. National Commission on Forensic Science. 2017. https://www.justice.gov/archives/ncfs. Accessed 6 Oct 2017. CBS 60 Minutes (Producer). The pentagon’s bionic arm. 2017. https://www.cbsnews.com/news/the-pentagons-bionic-arm/. Accessed 6 Oct 2017. CBS (Producer). Imagining the future of restoration. 2012. https://www.cbsnews.com/videos/imagining-the-future-of-restoration/. Accessed 6 Oct 2017. Defense Advances Reserach Projects Agency. Revolutionizing prosthetics. https://www.darpa.mil/program/revolutionizing-prosthetics. Accessed 6 Oct 2017. Brainline.org (Producer). DARPA: giving back life and movement with the revolutionizing prosthetics program. 2013. https://www.youtube.com/watch?v=95yLf4fzARk. Accessed 6 Oct 2017. Johns Hopkins University Applied Physics Laboratory (Producer). Modular prosthetic limb. 2011. https://www.youtube.com/watch?v=DjzA9b9T3d8. Accessed 6 Oct 2017. President Donald Trump. National Biodefense Strategy. 2018. https://www.whitehouse.gov/wp-content/uploads/2018/09/National-BiodefenseStrategy.pdf. Accessed on 9 Dec 2018. Georgetown University. Biohazardous threat agents & emerging infectious diseases. 2017. https://biohaz.georgetown.edu/biohaz-masters. Accessed 6 Oct 2017. CITI Program. Dual use research of concern (DURC). 2017. https://about.citiprogram.org/en/course/dual-use-research-of-concern-durc/. Accessed 6 Oct 2017.
International Federation of Biosafety Associations (Producer). Professional Certification. 2017. http://internationalbiosafety.org/index.php/147-professional-certification#. Accessed 6 Oct 2017. Hoyle J. Next generation global health security network. http://ghsanextgen.wixsite.com/home. Accessed 6 Oct 2017. Johns Hopkins University Center for Health Security. Emerging leaders in biosecurity fellowship. http://www.centerforhealthsecurity.org/our-work/emergingbioleaders/. Accessed 6 Oct 2017. Palmer M. Synthetic biology leadership excellence accelerator program. https://www.synbioleap.org/. Accessed 6 Oct 2017.